This was my favorite book of the duet! 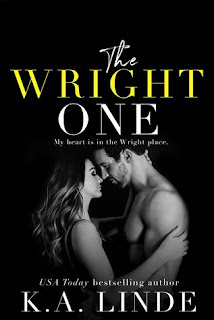 The ending of book 1 had me on the edge of my seat I wasn’t sure how everything would play out in The Wright One. If I had to pick three words for the book they would be love, perseverance and acceptance. David and Sutton have this amazing chemistry that has you cheering for them, but the outside forces keep delivering blow after blow. My biggest complaint would be Sutton’s wavering; David works extremely hard to pull Sutton out of her shell only to have the littlest wave send her running. There is a part in this book that pulls on the heart strings. It was hard to read but it needed to be in there to make the necessary changes occur. This scene was one of my favorites, I was like FINALLY! TWO is a bit predictable but I still devoured this book in a matter of hours.